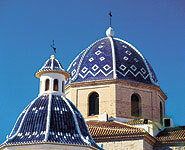 Just 40 minutes from Alicante airport is Altea symbolised by its blue and white domed church. It lies between the sea and the mountains and is filled with the charm of the quintessential Mediterranean village. The old part of Altea certainly deserves a visit. There is a labyrinth of cobbled streets, filled with restaurants, many art galleries and unusual shops. At the top of the village, inthe square next to the church are an array of cafés and a handicraft market during the summer months. While Altea does not have the impressive sandy beaches of other areas, it does have popular pebble and sand beaches as well as a nudist cove. For seafarers Altea has its own yacht club sailing schools, kayaking, diving centres and 2 marinas whereyou can rent sail or motor boats. For trekking, the Sierra Bernia offers beautiful landscape as well as rugged mountain walls perfect for climbing. Closer to home Altea has a sports centre where you can play tennis, hockey, handball, volleyball, basketball and five-a-side football or swim in the Olympic-size pool. Golf enthusiasts can play at the 9 hole Altea Golf Club at the foot of the Sierra Bernia. Altea´s many festivities draw thousands of visitors, the most spectacular of which is the musical firework display on the second Saturday in August. Property prices here are higher than the neighbouring Calpe, as its wealth of 5 star hotels, yachting facilities and top resorts attract the affluent Spanish holidaymakers.